Getting lossless audio rips of music from the F-Zero X Expansion Kit may actually happen one day after all! ...though that still may require some sort of stand-alone music player since 1. N64's funky sampling rates would be resampled by the OS and 2. in-game sound effects would normally get in the way (specifically the "GO!"). Last edited by Nintendo Maniac 64 on Tue Jan 06, 2015 5:19 pm, edited 2 times in total. Let me guess: Few days ago there has been an announcement as 64DD was dumpable. Few days after someone dump every 64DD games. You get them and play with it. Please tell us when it's time! Narann wrote: Let me guess: Few days ago there has been an announcement as 64DD was dumpable. Few days after someone dump every 64DD games. You get them and play with it. I hope so! It could be a clever move to make CEN64 get the spotlight it deserves. Thanks for sharing this advancement! "Change is inevitable; progress is optional"
Would it be bad if I reposted this screenshot elsewhere on the internet? Or should I wait for the video? Yeah! Tiny teasing vid on Youtube! Enjoy the fame! Narann wrote: Yeah! Tiny teasing vid on Youtube! Enjoy the fame! I've got bigger fish to fry yet. I didn't test out the Windows build, so let me know if I broke something. I had a few issues getting non-DD things to work after I added DD support. Please can someone post the md5 hash of the IPL ROM? Or I have a bad dump, or I don't know how to launch it...Help me! I just noticed that, when zoomed in on the screenshot, the grid pattern in the background makes it quite easy to see that there's like 5 or so extra vertical pixels that shouldn't be there... in other words, the image is stretched vertically by 5 extra pixels or so. Snowstorm64 wrote: Please can someone post the md5 hash of the IPL ROM? Launch with option -ddipl before you put the pifdata.bin and the ROM. No idea how to launch actual DD ROMs yet. Keeps telling me that it's an unknown CIC, even when I tried byteswapping it. That's the F-Zero Expansion kit, though. So maybe if I tried a standalone game it would work. Thank you! So a regular ROM is needed to get it working....Hm. Hopefully it will be patched soon, so we can launch 64DD ROM instead of regular ones. Snowstorm64 wrote: Thank you! So a regular ROM is needed to get it working....Hm. Hopefully it will be patched soon, so we can launch 64DD ROM instead of regular ones. I am trying to reverse engineer the communication protocol that the 64DD uses. If you don't do what it expects, it freezes the console. Right now, it looks to be reading the RTC and expecting a response of some sort. MarathonMan wrote: I am trying to reverse engineer the communication protocol that the 64DD uses. If you don't do what it expects, it freezes the console. Right now, it looks to be reading the RTC and expecting a response of some sort. Wow... You, along with LuigiBlood and marshallh, are the best thing that happened to the N64 in the last decade at least! Congratulations on yet another incredible achievement. juef wrote: Wow... You, along with LuigiBlood and marshallh, are the best thing that happened to the N64 in the last decade at least! Congratulations on yet another incredible achievement. TBH, OzOnE was the one who really got the ball rolling with 64DD support, and is helping me with another huge project behind the scenes. Lots of credit goes out to him, too! Basic communication between the console and the 64DD works. The RTC is quasi-functional (I just need to implement the ability to store/fetch the date, but it doesn't freeze the console anymore), and when I set the "disk present" bit, the 64DD IPL ROM tries to seek and start loading a disk. Felt like coming in here. Anyway OzOnE pretty much did some huge work before as he tried to make a dumper with an Arduino. Then we both worked on a dumper using libdragon, but it failed because of timing reasons. So I got impatient and I used the N64 SDK, and marshallh added SD card writing code and a few fixes. The last day of 2014, every games were dumped before any country could even say "Happy New Year 2015!". I've been polishing it since and been working on a new dumper for development disks. 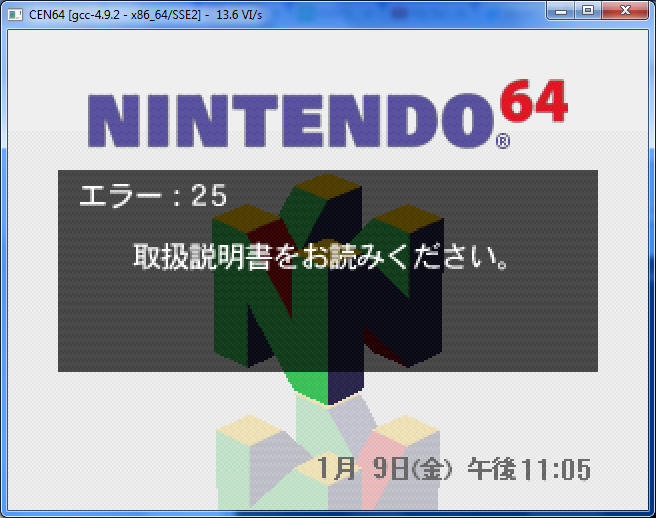 ...and now I help on CEN64's 64DD emulation. LuigiBlood (but also MarathonMan, OzOnE, marshallh and anyone that have contributed on this 64DD project), thank you so much for making this happening! Also, I have a question for you: Will be Dezaemon DD ever re-dumped with your tool? I know that Super Mario 64 DD is already on the way, but I don't know who owns the Dezaemon DD prototype...and whether he can be contacted...Is there a possibility? Snowstorm64 wrote: LuigiBlood (but also MarathonMan, OzOnE, marshallh and anyone that have contributed on this 64DD project), thank you so much for making this happening! willis82 who owns 3 disks of Dezaemon DD contacted me to offer his help to test my homebrews. And by sheer luck, I got to know Nekokabu who owns 2 disks of Dezaemon DD, and has been testing my homebrews for a while, unfortunately his english is rather broken because he's japanese, but he's a great guy. Anyway Dezaemon DD is gonna be redumped. I don't know when, but it will. Other two questions: Are you still defining the 64DD format and its file extension? Can you explain briefly them? Snowstorm64 wrote: Good to know it. I think the format won't change after all, but the extension will change to *.ndd. The format is similar to the other dumps we got of F-Zero X Expansion Kit and Dezaemon DD: The main difference is that they include the System Area Blocks right at the start. The order goes like this: ROM area (System Area + User Area) and THEN RAM area, which is rewritable, and I think we'll generate new files with just the RAM area, possibly with this extension: *.sdd. I like the idea to easily give the RAM as a seperate file instead of a patch. The main point of the 64DD is making content, so easily share them is a good thing. LuigiBlood wrote: I think the format won't change after all, but the extension will change to *.ndd. So the RAM area of the .ndd will be completely untouched and we have to use the .sdd for user content? Then I'm fine with this, please do it! Snowstorm64 wrote: So the RAM area of the .ndd will be completely untouched and we have to use the .sdd for user content? Then I'm fine with this, please do it! For now, I'm waiting for SSE2 support to work on Windows. My CPU is too old to support SSSE3/SSE4.1/AVX. Then I'll be able to work on it. LuigiBlood wrote: For now, I'm waiting for SSE2 support to work on Windows. My CPU is too old to support SSSE3/SSE4.1/AVX. Must be a fellow pre-Bulldozer AMD CPU user - I totally had the same issue before my AM2+ mobo ended up dying anyway. You wouldn't happen to have at least an older Core Duo or Solo Socket M laptop or an old LGA775 Pentium 4 desktop, would you? Both of these sockets can support a 1st generation Core 2 Duo which would include SSSE3 support; if you want to go the cheap route you could even use a Core2-based Celeron. Also a fact many people may not know - the AMD Bobcat core, such as those used in the low-end E-350 APU, supports SSSE3. I don't have anything like that, and been an AMD user for a while, but I'll probably change to an Intel for my next PC someday... which is not going to be soon. Well on the bright side, your issues alone may be enough of a catalyst to see the SSE2 windows builds get fixed before Half Life 3 comes out. LuigiBlood wrote: I don't have anything like that, and been an AMD user for a while, but I'll probably change to an Intel for my next PC someday... which is not going to be soon. If it's going to be that far in the future, then Zen may even be an option. EDIT: Ok MarathonMan, question - are those 6 extra vertical rows of pixels actually intentional behavior? I just realized that both times I've mentioned it you haven't responded to it at all, which makes me believe that I was mistaken in thinking that it is in fact a bug in the first place. If this is intended behavior, does this mean that the N64 actually outputs a native resolution of something like 320x237 / 640x474? If this is the case, then is stretching vertically to 240 / 480 pixels really the best way to handle this? Seeing how Cen64 has no fullscreen support (currently), would it not make more sense to just directly output a 320x237 / 640x474 video signal? That way, in the future when we have options and stuff, we can configure if we want fullscreen to be stretched to 240 / 480 pixels or if we want it to be letterboxed with super-tiny black-bars on the top & bottom. Last edited by Nintendo Maniac 64 on Wed Jan 07, 2015 6:02 pm, edited 1 time in total. Nintendo Maniac 64 wrote: EDIT: Ok MarathonMan, question - are those 6 extra vertical rows of pixels actually intentional behavior? I just realized that both times I've mentioned it you haven't responded to it at all, which makes me believe that I was mistaken in thinking that it is in fact a bug in the first place. If this is intended behavior, does this mean that the N64 actually outputs a native resolution of something like 320x237 / 640x474? If so, is stretching vertically to 240 / 480 pixels really the best way to handle this? Are you not speaking of something moderately different? Specifically, you mention something like only 1 pixel less than what is being rendered, while I'm speaking of 3 / 6 pixels. No, we're talking about the very same thing. It's a scaling issue. CEN64 has a fixed window that is 640x480, but the N64 renders at 640x474, so there are 6 pixels off. To overcome this issue, CEN64 just adds (or better duplicate) those 6 lines. Snowstorm64 wrote: No, we're talking about the very same thing. It's a scaling issue. CEN64 has a fixed window that is 640x480, but the N64 renders at 640x474, so there are 6 pixels off. To overcome this issue, CEN64 just adds (or better duplicate) those 6 lines. Ok, but now the question is, does the real-life N64 hardware actually scale up the 320x237 / 640x474 image to 320x240 / 640x480, or is that something done by the TV? If the latter, shouldn't that be something that isn't directly "burned" into Cen64's simulated N64 rendering pipeline in the same way that it doesn't include any CRT or NTSC filters? I don't think the TV plays a role in this, at the times there was only a resolution, 480i. Maybe it was the NTSC video mode that wasn't perfect, so they had to set the N64 to output at an inferior resolution, in order to match it. Snowstorm64 wrote: I don't think the TV plays a role in this, at the times there was only a resolution, 480i. Maybe it was the NTSC video mode that wasn't perfect, so they had to set the N64 to output at an inferior resolution, in order to match it. But it isn't that simple because 240p is not actually the same as 480i, which is why some older HDTVs could not display 240p even though they could display 480i. Not only that, but consider SNES games with their 256x224 and 256x448 resolutions. Heck even the "full" NTSC resolution is 720x480. I believe the scaling on these consoles occured during the digital-analog video conversion. In other words, it occured as part of the encoding of the NTSC signal. However, this is largely conjecture. I'm not certain on the vertical bands on either edge of the window, but I think they're correct. I really haven't put any effort into the VI/RDP at this point. The MAME/angrylion RDP (and VI) are 'good enough' for now. Please can someone post the SHA1 and MD5 hashes of all 64DD games? Because I cannot match my hashes with those found in the web. I probably sound ignorant asking this, but why is the code forked instead of being added to the main version? Because, in this case, one can start experimenting on his fork and then he can share his commits with others, without contributing to the parent project. This is useful, for example, for testing the code and, if all goes well, those commits will be sent to the parent project, for the contribution. Snowstorm64 wrote: Because, in this case, one can start experimenting on his fork and then he can share his commits with others, without contributing to the parent project. This is useful, for example, for testing the code and, if all goes well, those commits will be sent to the parent project, for the contribution. I see. I thought it might be to ensure the code was kosher before rolling it into the official version. Thanks. Nintendo Maniac 64 wrote: Ok, but now the question is, does the real-life N64 hardware actually scale up the 320x237 / 640x474 image to 320x240 / 640x480, or is that something done by the TV? If the latter, shouldn't that be something that isn't directly "burned" into Cen64's simulated N64 rendering pipeline in the same way that it doesn't include any CRT or NTSC filters? TVs (Especially the tube TVs of the mid 90's) normally don't display the entire generated picture. So it's possible that the N64 just generates black during those raster lines since they won't be seen anyways. Someone with an old TV can test this by very carefully screwing with the vertical hold dial on their tube If the picture can't ever cover the entire screen, then it's not generating 320x240, and the CEN64 window should be resized accordingly. What's the point of having a pixel accurate RDP, if the pixels are then skewed when blitting to the screen? Great news, the Windows SSE2 builds are working again! beannaich wrote: Someone with an old TV can test this by very carefully screwing with the vertical hold dial on their tube If the picture can't ever cover the entire screen, then it's not generating 320x240, and the CEN64 window should be resized accordingly. I recall LuigiBlood saying one of the disks/dumps was slightly corrupt the other day. Doshin The Giant 2's dump is bad. There are bad blocks in bad places. ...it's the last obstacle. I think. I hope. And to give you an idea: I got stuck with this error for hours. I don't know what to do actually. LuigiBlood wrote: Doshin The Giant 2's dump is bad. There are bad blocks in bad places. Because the disk is damaged? It's strange that there are only two dumps of Doshin the giant 2 so far...We need a third owner of this game. 01: N64 disk drive may have been broken down, or Disk may be bad. 02: Eject button may have been pushed in half way during access. 21-25: N64 disk drive may have been broken down, or Disk may be bad. 31-35 : N64 disk drive or N64 control deck may have been broken down, or Disk may be bad. 41: N64 disk drive or N64 control deck may not be connected properly. 51: Disk may have been removed during access. We have a third owner. Here's the thing, at the point of the screenshot: It was loading the game data. It was about to load the game and run it. But something messed up: And I don't find it.